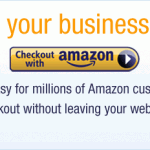 Parcel2Go makes life EVEN easier for users via Amazon Payments! Parcel2go has added an Amazon payments option to their website, allowing Amazon users to pay for goods easily through their Amazon account. This means that you can now pay for a delivery service using the payment details already stored in your Amazon account, via a secure connection directly to the Amazon payment servers. This is great news for those who use Parcel2go’s great courier service, as it is another safe way to pay because your payment details never leave Amazon’s secure website – reducing the risk of being accessed by a third party. 318 other websites are currently using Amazon Payments, and Think tank L2 cites Amazon as the online retail market leader with various delivery options, detailed product reviews and competitive prices. And last year, Amazon held an impressive 37 per cent share of the m-commerce market, with market research firm ForeSee revealing Amazon was the top of the board when it comes to consumer satisfaction, with 84 out of a possible 100 being the highest score, compared to other online retailers in the new ForeSee Mobile Satisfaction Index. Amazon Payments allows Parcel2go’s customers a smooth and straightforward process for Amazon users, even if you have never used our website before! This gives millions of Amazon customers an additional secure way to pay for their postage, adding to the various available existing payment options. Are you happy about this news? Will you be using this new method of payment to send your parcels?